Calhoun Community College has two campuses and one site. Our Decatur campus is located just north of the Tennessee River on Highway 31 and is close to 1 mile long. Our Huntsville campus, located on Wynn Drive in Cummings Research Park, sits adjacent to the U.S. Space and Rocket Center, just off I-565. Our combined credit student enrollment is just over 10,000 . The Alabama Center for the Arts site (ACA) is located in downtown Decatur across from the Princess Theatre. Whether you have made your choice to attend Calhoun or have just started your educational journey with us and need a guided tour or would like to visit a class, we welcome you to schedule your campus visit today to get a first-hand look at our beautiful campuses and what we have to offer. We have several options for tours depending, on which campus you wish to tour and your specific needs. Want a tour of the campus from a student perspective? Calhoun’s Warhawk Student Ambassadors provide short tours lasting approximately 30-45 minutes which are designed to show you around campus and give you a little student insight on what to expect when you become a Calhoun student. To schedule a student guided tour call 256-306-2560. 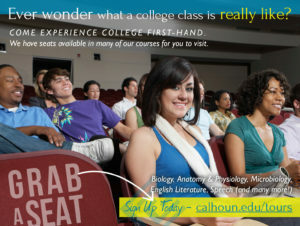 Would you like to learn more about Calhoun’s campuses, programs of study, or the process for becoming a Calhoun student? Then perhaps a Staff Guided tour is perfect for you. These individual tours are given by our Outreach Advising staff on the Decatur, Huntsville, or Alabama Center for the Arts campuses. An appointment is required for a tour and the tour will last approximately an hour. Would you like to bring a group of 5 or more to tour Calhoun? Please complete the group tour request form below and choose which campus you would like to tour. Requests must be made at least two weeks in advance. We offer group tours at our Huntsville Campus, Decatur Campus, or the Alabama Center for the Arts. We will, based on availability, honor as much of your request as possible. Please know that tours will not go over 3 hours in length. Tours are not typically offered on Fridays, Saturdays, or Sundays. If that is part of your request, please notate that in the Additional Requests section..
Class Visits — Grab a Seat! Have you ever wondered what a college class is really like? Grab a Seat in one of our classrooms and experience life as a college student first hand. Our faculty welcome you to their classrooms! Here are just a few of the classes you can visit! Biology, Anatomy & Physiology, Microbiology, English Literature, and Speech. Click on the links below to schedule your class visit today!